The students are given two sets of points (1,2) and (3,6). They are asked to find and draw the slop with these two points. In a previous blog, I explained about drawing a slope line using pirates. That is a good visual image to use once you have an equation. But, when visual learners are given two sets of points and asked to find the slope, this sometimes puts up a brain block. So, I tell the kids that they are going skiing. 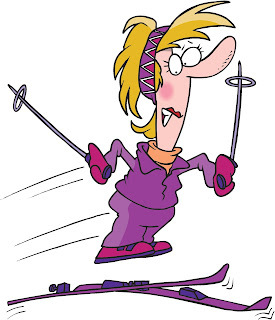 We are going to hit the "slopes." When I present the two sets of points, I explain that these are really a couple. There is a boy (x) and a girl (y). One class even gave them names: Xavier and Yvonne. Then I tell them that the numbers are actually the times in minutes it took for each to get down the hill/slope. You explain that the ski competition was in two parts, the top part of the mountain and the bottom part of the mountain. The first set of points represent the bottom times, the second set of scores represent the top times. In order for each to calculate their total scores, they have to subtract the two times. (We are not taking an average here). But because GIRLS GO FIRST, it is important to rearrange the scores. In the example of (1,2) or (x,y), I tell the kids that this is their bottom of the mountain scores. In the second set of points, (3,6) or (x,y) I tell them that these are their top of the mountain scores. First the students must decide which scores belong to Yvonne. I tell them to use their colored pencils. Yvonne is wearing a yellow ski outfit. (I used yellow because I always have the kids color the y axis yellow. Next, I tell them that Xavier is wearing green. I always have them color the x axis green (for grass). I have them trace over the y coordinates with yellow and the x coordinates with green. With enough examples, this becomes routine. So, Yvonne's scores are 2, and 6 (in yellow). Xavier's scores are 1,3 (in green). This step is the most important. This is where our visual learners get lost. So use LOTS of examples. Next, in this particular skiing competition, the rules state that YOU MUST SUBTRACT YOUR bottom of the mountain score from your top of the mountain score, REGARDLESS OF SIGNS. So we will rearrange Yvonne's scores (y points) to (6,2) and Xavier's scores to (3, 1). It is important to reinforce the concept that we did not rearrange these scores to put the larger number first. In other sets of points, the larger number might be second. Once you have shown them this formula, you can reinforce the idea by pointing out that ladies go first, that is why Yvonne's scores are on the top. Then you reinforce that her top of the mountain time is first. Her bottom of the mountain time is subtracted from that. This rearranging of the points is VERY important for visual learners. Without a story, they will probably get confused and lost. 6 -2 equals 4 equals the m in y=mx + b. This can be simplified to the number m=2, but you need a fraction to draw the slope, so I would let the class leave it at 4/2 to draw the slope. Step one: color the points (5,8) (2,9) or (5,8) (2,9) if you can't read the yellow. (9,8) girls go first, so these are Yvonne's scores. subract the x's. 2-5 equals -3 which is the fraction we need to find the slope. If the students ask why are the bottom of the mountain scores listed first, tell them that it was snowing heavily at the top of the mountain, and all competitors had to ski this part of the slope first. Reinforce this concept many, many, many times. Tell them the exponents represent the first and second runs down the mountain.